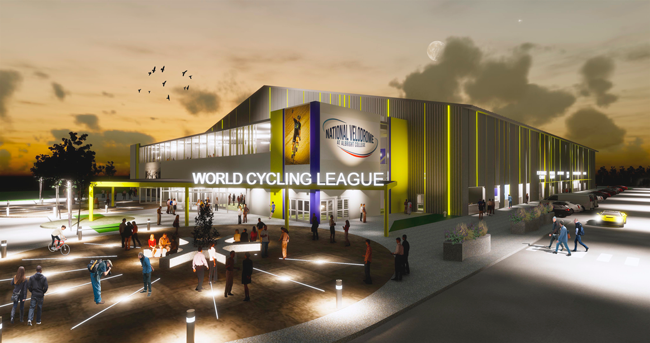 June 12, 2017, Reading, PA: Designs of the first indoor velodrome on the East Coast have been released just two months after World Cycling League (WCL) and Albright College announced their partnership with the Reading community to develop the facility on a site owned by the liberal arts college in Reading, PA. The National Velodrome at Albright College will be a 2,500-seat, high-tech cycling arena designed to host World Cycling League tournaments, year-round cycling programs, pre-Olympic training camps and events, collegiate activities and a variety of other sporting events and special programs. 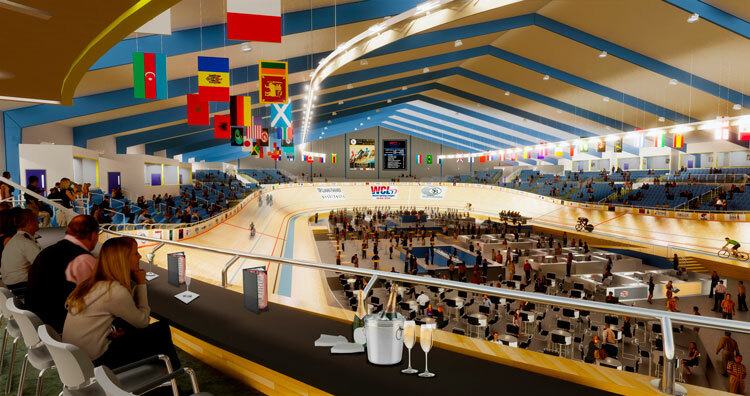 In addition to permanent spectator seating around the track, amenities will include a trackside bar/restaurant, sky boxes for corporate partners and season ticket holders; leased space for specialty businesses; team, club and locker rooms; and storage areas under the track for bicycles, specialty flooring and temporary seating. The building will also be wi-fi and livestream capable throughout, Nelson added. The WCL has assembled a team of experts to design and build the multi-use facility that features a world class 200 meter steeply banked board velodrome built by Canadian architect, Peter Junek, designer of velodromes for international competition in Canada, Chile, China, Mexico, Puerto Rico, Portugal, South Korea and the U.S. Stillman Farmer Architects of Bethlehem is designing the building that will be constructed by The Burkey Group of Reading. Stackhouse Bensinger of Sinking Spring is the civil engineer of the project. Eric Burkey, president of the Burkey Group is an avid cyclist whose company will manage construction of the velodrome. “This is a unique and exciting project for us and for me personally. We have a very enthusiastic team committed to fast tracking the planning and construction process and we are thrilled at the unusually high level of support we are getting from the community.” The Burkey Group has provided construction services for a variety of area projects including high tech facilities, movie theaters, restaurants, sports facilities, historical site restorations and several projects at Albright College. According to John Nelson, the total project cost is estimated at around $20 million. Construction financing will be spearheaded by a team of real estate investment specialists from Greenwich, CT, who have secured public, private and municipal financing for a variety of unique real estate projects throughout the United States. The WCL, in association with the Greater Reading Economic Partnership, Albright College and others is reaching out to community civic and business leaders for ongoing support. Financing and all required approvals and permits are expected to be in place for construction to begin this fall with the goal of opening the velodrome for the 2018-19 academic year. 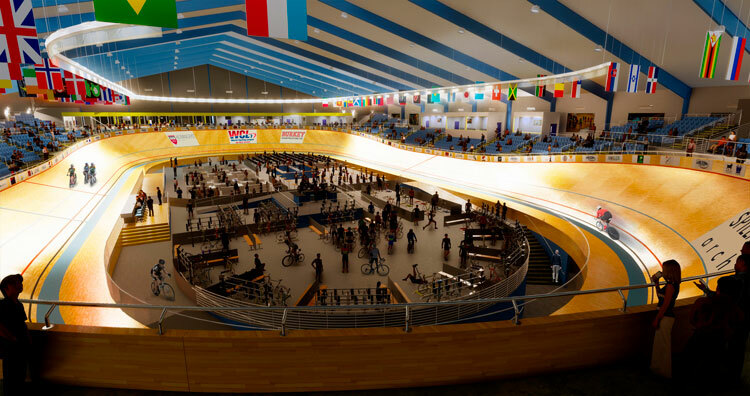 This timeframe will also accommodate World Cycling League’s first season and provide East Coast cyclists with an indoor facility to prepare for the 2020 Olympics. The World Cycling League is the first independently owned and funded indoor track cycling league. Financed by individual investors, World Cycling League, LLC owns the registered trademarks World Cycling League® and TeamTrak®. 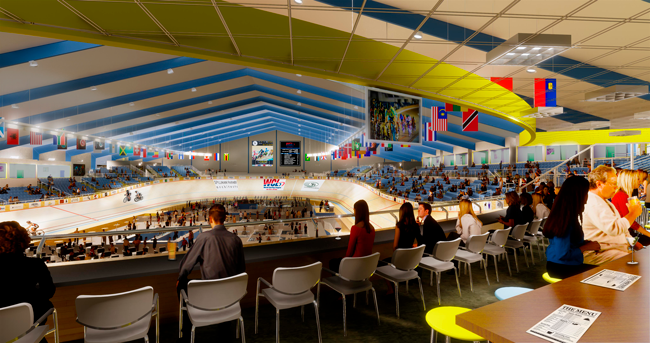 The WCL has plans to expand globally following its first season introduction at the National Velodrome and Events Center Albright College.